Pages let you collect online donations. You can send donors directly to a page's unique URL, or you can embed the page within another web page. Pages can be connected to individual campaigns and appeals, which helps you track which fundraising efforts get the best results. Once you enable online donations, Populi creates a Default donation page. You can click the page link to see what it looks like, or grab an iframe embed code using the links next to each page name. If you need to delete a page, hover over its name and click . Go to Settings > Pages and click Add a page. Go to a campaign and click add next to Online Donation Pages. Either way, the steps you take to create a page are the same. This lets you identify the page within Populi; donors will not see it. If you're creating multiple pages to match up with individual campaign appeals, the internal name is the best way to distinguish these pages at a glance. For example, if you have appeals called Donate Now Postcard and Donate Now Email, you might create two pages called DN Postcard and DN Email. These optional items will be visible to donors visiting the page. If you wish to connect this page with one of your campaigns, select it from the drop-down. You can then select from that campaign's appeals (if any) in another drop-down. You can let your Donors choose from any of your funds, set a single fund to which they can donate, or allow them to choose mutliple funds over which they can distribute portions of their donation. Any amount over: Enter the minimum donation amount for this page. Keep in mind the Minimum online donation amount in Settings > Other Settings. Choose from preset amounts: Enter specific amounts for your donors to choose from. As you go, new fields will appear so you can add as many preset amounts as you need. When you’re done, just leave the last one blank. One preset amount: Enter one specific amount for donors visting that page to donate. Preset amounts OR any amount over: Lets you combine a number of preset amounts together with a minimum donation amount. 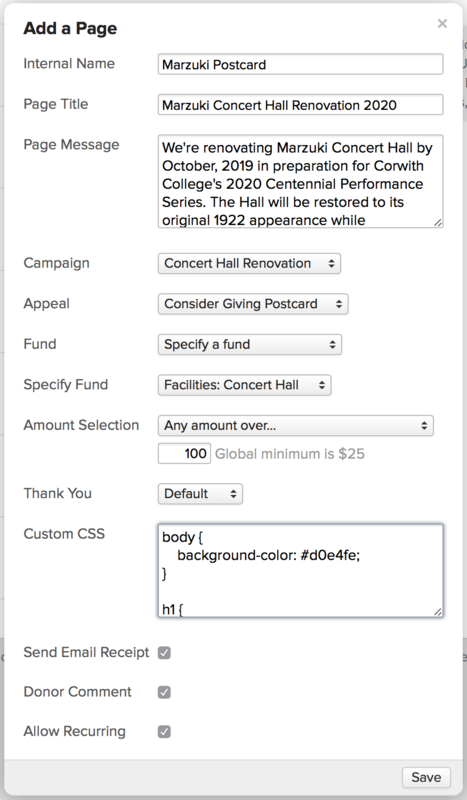 Default: This directs donors to the standard, built-in Populi Thank you page, which simply says, “Thank you for your donation to [School Name]” and links to a donation receipt. Message: Enter your own thank-you message; the donor will be directed to a page with this message and a link to a donation receipt. Redirect: Enter a URL to which to send your donors after they submit their donation. Copy-paste CSS in the text area to give the page a similar look and feel to the website in which you're embedding it. Check this to automatically email the donor an electronic receipt. You can always send a receipt later on; the default and message thank-you pages also contain links to the receipt. Check to give donors a comment box on the donation page. Check to allow your donors to create recurring monthly donations based on the options they choose on this page.